Another fortnight gone and another challenge. I thought we could embrace the warm sticky weather and involve some water this time round! For this challenge I want to see you having fun with things that float or sink! The STEM element of this challenge is all about exploring density and buoyancy. For example most children would think the heaviest item will sink but you give them a big rock and a little rock, they’ll both sink because they’re both dense. Shatter that misconception early and you can help them start thinking about things a little differently! After receiving some feedback I’ve decided to do some examples for you all based on ages. Handy for me too as I have a good spread with my boys aged 2, 6 and 8! A simple suggestion is 2 bowls of water and a pile of water safe random objects. Help them work out what sinks or floats and then sort them into their bowls respectively. It’s a nice visual for younger ones and water play adds a sensory element that ensures some fun! He added each item one at a time and we discovered if it sank or floated. This mainly involved Loki shouting at a crayon rock for sinking and using the toothbrush to bash a Bee… but the visual was clear he saw that only the crayon rock sank and we moved it to other water bowl. He then had lots of fun throwing anything he could get away with into the water and shouting “sink” as loud as he could! My 6 year old, Oren, collected his own items from around the house to see what would sink or float. Before he added them to the water we got him to predict what would happen. He was fairly confident the wooden peg, driftwood and lolly stick would all float. He thought the milk bottle lid and Lego brick would float but could be sunk if pushed under. Oren thought the shell and coins would sink and that the Storm Trooper and Cork would initially float but eventually sink too. With the help of his little brother we found that both the Lego brick and the milk bottle lid floated but if upturned only the Lego brick sank. Also the Peg surprisingly sank despite being made of wood and the Storm Trooper floated quite happily! Oren was particularly fascinated with the milk bottle lid. He filled it with water to try and make it sink, he put coins and rocks in it to try and weigh it down but was surprised to see it floated back up every time. He then spent more time seeing if he could make different items float or sink if they were upturned, sideways, wet or dry before going in. Lots of self led exploration opportunities there. 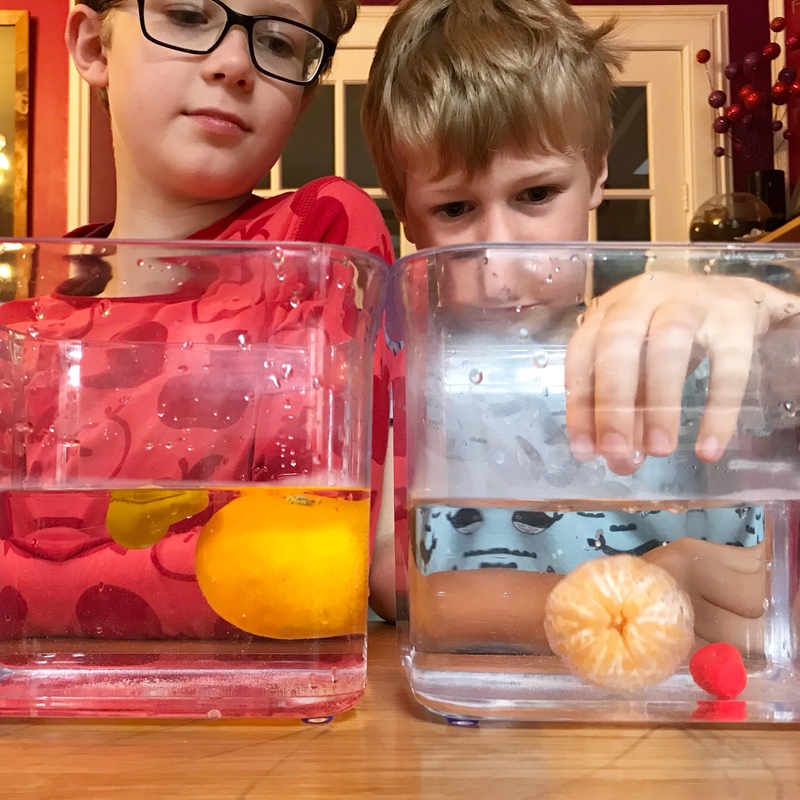 For my 8 year old, he wanted to use an orange as part of our experiment. So we used one peeled and one unpeeled. Edward was sure the peeled one would float and the unpeeled would sink. He was quite shocked to find it was the opposite. He then hypothesised that if the Orange was broken into segments they’d all float as they’d be lighter but again was proved otherwise. Edward quickly realised weight had nothing to do with it and fetched the kitchen scales to check the crayons. He was shocked and somewhat delighted to discover that the larger heavier crayon floated, whilst the smaller lighter crayon sank. He then spent the next half hour trying to find the heaviest thing to float (checking with the scales) and the lightest thing to sink. I left him to it! How many items can you fit in a boat before it sinks? Does something sink different depending on what way round it is? So you’ve got 2 weeks to show me your best sinking and floating set ups and have lots of fun! Maybe you could show me the most random Babipur item that sinks or floats. The winner can choose a Plan Toys Boat and wee Penguin/Walrus/Seal/Polar Bear friend as their prize! All you have to do is when posting your picture in the Facebook Babipur Hangout Group is use the tag #babipurSTEM so I can find it. Same goes for Instagram but in addition can you tag #babipur also. Next Fancy calling him that?! Can’t wait to see if the penguin 🐧 floats or sinks !